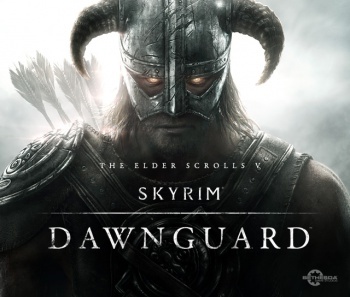 Skyrim's Dawnguard content will begin as a 360 exclusive. Bethesda has posted a teaser image (and not much else) for Dawnguard, the first round of extra content for Skyrim. We don't know much about the DLC at this point, other than the fact that Dovahkiin still has yet to find a razor capable of trimming his epic man-stubble, and that only Xbox 360 users will have access for the first thirty days. More details, Bethesda assures, will be released at E3 in June. Though there's nothing more official to be said about the announcement, there are still a few things we may be able to glean with the facts at hand. Last week, a Bethesda forum-user dug through the latest game patch (1.5.26) and discovered some interesting additional baggage alongside the bug fixes. Numerous files buried in the code reference a character referred to only as "Snow Elf Prince," alongside a list of animation files for crossbows. As you likely already know if you've played through the RPG, neither snow elves nor crossbows have yet to make an appearance in Tamriel. Travelling deeper into the speculation hole, one may also consider a final point: vampires. The files uncovered in the latest patch also allude to new vampire animations, which may or may not hold any special significance considering the group's existing inclusion within the game. However, I'd like to also point out that the name Dawnguard could be referencing the creatures' nocturnal tomfoolery alongside the citizens determined to quell them. Then, there's also whatever is going on with Dovahkiin's eyes in the teaser image. That's not necessarily the sign of a nasty case of Sanguinare Vampiris but, well, there's something unnatural going on there.